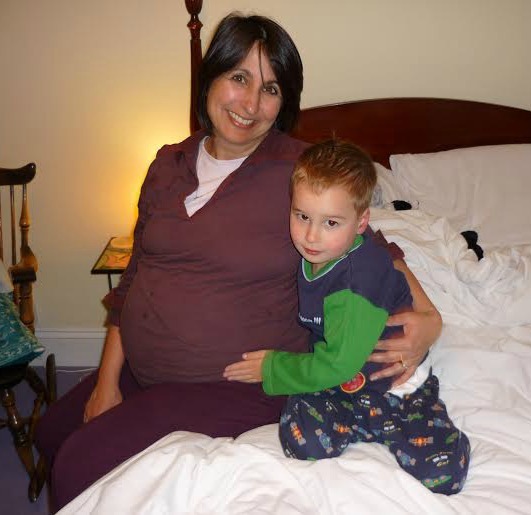 Older Single Mum: The NCT, Single Parents and Me. 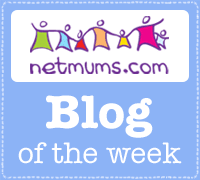 The NCT, Single Parents and Me. That's little old me - unable to see over the lectern! 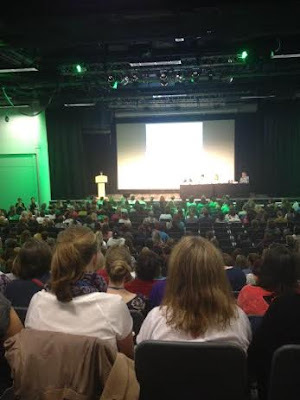 I was recently asked to share my experiences of being a single parent at the Annual National Childbirth Trust (NCT) Conference and suggest ways in which they can better support us. Little did I realise this would render me a Keynote Speaker in their programme and up on the main stage right at the outset of the day! I thought it was ironic - because they are trying to shed their middle class image, whilst I have always been trying to claim one for single parents since beginning this blog and although it seemed a good idea in principle - as it's something I can yack about until the cows come home - the thought of standing in front of several hundred people was enough to wake me in the middle of the night for the duration of the few weeks between naively readily agreeing and the due date. But once I was there, it was an important enough occasion and job in hand to just get on with it and even though my nerves were making it impossible to see my notes and I couldn't see over the lectern and it was one of the hardest things I've ever done in a life that has never been short of adventures, it simply had to be done. The introduction said I would talk about the time I slept with Daniel Craig, which we figured would get their attention and, picking up the baton from a Stay at Home Dad, it made sense to run with it. I asked our audience - mainly NCT Practitioners and Volunteers - to consider why it is that our society views such men as heroes, whereas Stay at Home Mums aren't seen the same way. And I pointed out how should such men, or indeed any men, happen to be Single Fathers, how they are automatically elevated to Superhero status, but the term 'Single Mother' conjures up a totally different image. The people at the front were nodding along and, unbeknown to them, they kept me going. Not that I could really see. With my glasses off, the audience was clear but my notes were indecipherable, yet with them on, it was vice versa. I was in a right old faff, truly quite jittery and really trying not to let it show! So, ploughing on bravely, I blamed the media and suggested that the stigma surrounding single mums is the first thing which needs addressing, plus I added the teenagers making up less than 2% single parents statistic, which always surprises everyone. Then I got personal, revealing how my ex-husband and I had led separate lives since he 'couldnt stand the f***ing sucking sound' of me breastfeeding our baby, that the first night we'd spent together in a couple of years had resulted in our second son and that I'd had to throw him out whilst only a few months pregnant. More than a few months pregnant - about to pop! 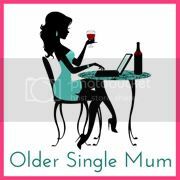 A single mum at 44. I put it to them that lone parents come in all shapes and sizes. Some can be married or in partnerships on the outside, but behind closed doors it's another matter. Others have partners working away (but they generally are privy to financial and emotional support that most single parents aren't) and only relatively few - but it's a number that's rising - choose to have children that way. I explained reaching out via my blog, how I discovered and featured other single mums - older, professional ones like me - all as far removed as it's possible to be from the way we've too often been portrayed and I very much regret it slipping my mind to mention the ladies (and men) who have been widowed, who also do a sterling job of raising their children single-handedly. Another favourite statistic about our average age - nationally - being 38, got a powerful reaction and I made it clear that none of us finds it easy. We're either on 24/7 and never-endingly knackered, which isn't really in the interests of the children, or we're missing out on up to 50% of their childhood. I confessed that no matter which way we may be doing things, it's hard, it hurts and the loneliness can be crippling. Plus, our aspirations for ourselves as well as for our youngsters don't change just because our circumstances have. So what did I feel they can do to help? 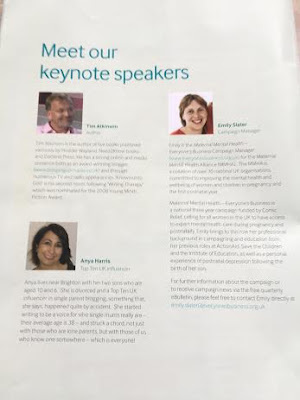 Having given this matter some thought prior to the event, I mooted a campaign called 'Look Out for Lone Parents' - using the expression in its double sense. And if, per chance, any might actually be out of the house attending one of the famous NCT ante or post natal groups, said it would be perfect if other members might be encouraged to offer them some normal solidarity instead of treating them like pariahs, because as experience goes, friends on the ground can be much more effective than Facebook ones - particularly where older siblings are concerned. NCT local networks have been providing a framework for firm friendships for over fifty years now so there is incredible scope within them. They can be a lifeline for lots of parents, regarldess of their personal situation and it makes sense to make the most of them. Honoured to be speaking alongside Tim Atkinson, Author and Emily Slater, Maternal Mental Health Campaigner. Protecting their mental health is paramount (and the person speaking after me went into this in more depth and in general, sharing shocking stories - including her own failed suicide attempts - about those who suffer PND), so easing pressures wherever possible - even in the smallest of ways, can make a massive difference. Meeting up for coffee, alternating a school run, or inviting them and / or their children over for tea - helps them feel less abandoned, ashamed or alone and this benefits the whole family in the long run. It was time to wrap up then, so I finished with it being a sad truth that the Superhero status isn't applied to any of the single mothers I've met on or off line, yet they are the bravest, strongest, smartest people I know and they deserve as much support and as little stigma as their male counterparts. So that was it - the gist anyway. It was quite an ordeal, being unaccustomed to presenting and it took me about a week to recover, but I was glad of such a huge opportunity and the feedback was overwhelmingly positive. I was treated brilliantly and there wasn't a hint of any middle class militancy. On the contrary - everyone involved was thoughful, sensitive and kind - possibly, again, as far removed as it's possible to be from the way they've too often been portrayed. But it didn't feel ironic, it felt inspiring and inclusive and I thank them from the bottom of my heart for trying to make things easier for people following the lone parent path. The NCT is a national charity. Their mission is to be an advocate, guide and friend for as many parents as possible through their First 1,000 Days. You can tweet them at @NCTcharity and / or find out more about them HERE. Well done! It must have been really daunting speaking in front of that number of people. I like your message that lone parents can also be in relationships. My ex, then my fiancé, came along to all of our NCT classes (oh, except the one when he had a golf weekend). I felt alone and more than just unsupported but actually undermined by my now ex during those first few months after having our son. I struggled breastfeeding at first but was really determined - he said that I should give up and set a time limit of 20 mins per breast each feed before he insisted we top up with formula. Looking back I feel angry at him, but at the time I just felt like a failure. I didn't tell my nct friends this but we used to meet regularly and everyone was finding different things challenging - others partners were supportive though. I split up with my ex when our son was 5.5 months. He is now 14 months. I am still breastfeeding and so much happier. Co-parenting is an immense challenge but we no longer live together and that is great. Thanks for flying the 'there is no one single mum flag'. Every situation is totally different. Anya, this sounds amazing and I wish I could have seen and listened to you giving this speech. I'm not a single mum but often feel single in terms of my marriage and can relate to so much of what you say here. I am always inspired by you. The NCT saved my life in those early days and I'm grateful for them. Gosh there is no way I could have stood in front of that many people and spoken with any type of incoherency, but you, it sounds like you did an amazing job. Dads always seem to be seen in the better light, even married if they are the stay at home parent. This attitude for single parents and married couples needs to be changed, generally they way women are seen in any light. Good for you for setting the record straight. I love all the points you made (and I was also surprised abbout the 2% statistic - that's not how the Daily Mail portrays it). I'd never thought about that Single father superhero vs Single mother no better than she should be attitude. So true. Well done, it sounds like you did a fantastic job. This is fantastic - well done you! I had never thought about the Superhero Dad thing before. Thank you. It seemed a natural thing to pick it up from the SAHD naturally being treated as a hero, so went with it! Wow, very well done to you, that must have been a daunting experience! It sounds like you have changed some opinions. I have the greatest respect and admiration for single parents. I really don't know how you do it! Thank you and yes, it was one of the most daunting things in my life! Well done to you - not only for overcoming any nerves and supporting others but to stand alone in the first place. It is not an easy decision to make and you are doing an amazing job. I am glad to hear the NCT are behind supporting single parents too.